When 32-year-old Zhang Tiegang from Southern China was sick of going food shopping he decided to train his dog to get the job done for him. 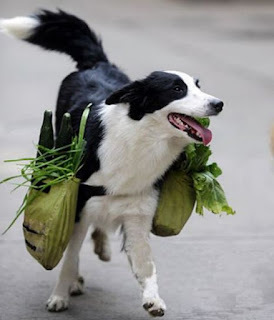 With a little practice it was only a matter of time before Deng Deng the one-year-old sheepdog was trained to go to the shop, pick out his food and carry it all the way home. According to his owner, the clever pup loves the job and he now even has his very own custom made saddle to attach the shopping bags too. All he needs is some money and a list and he comes home with the food and change. Tiegang is yet to explain how Deng Deng communicates what he wants with the shopkeeper, and his lack of opposable thumbs surely makes it tough to handle money, but it sounds like a decent arrangement for both parties.